One of the techniques for drylands water management identified in the earliest years of the G-WADI network was for the collection and management of flood- or rainwaters to increase water availability for domestic, agricultural or ecosystem use. This approach, called “water harvesting”, has been a traditional means of storing water in the Indian Subcontinent, the Middle East, North and East Africa, and the Americas for millennia. G-WADI Workshops on the topic have been held on three continents, beginning in 2005. 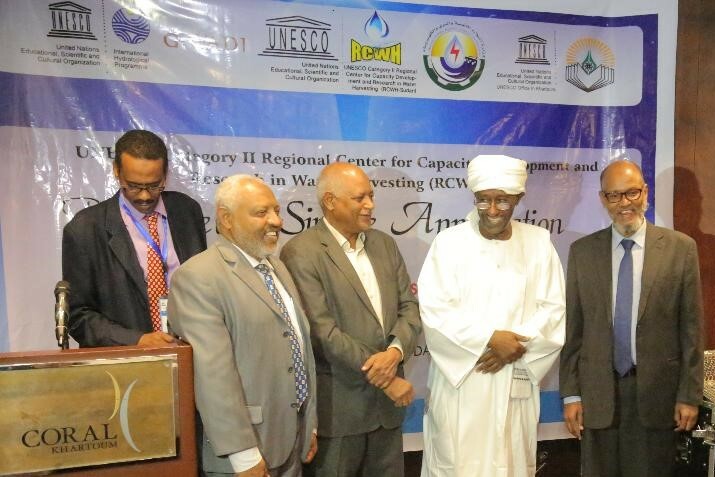 Most recently, the Regional Centre for Capacity Development and Research in Water Harvesting (RCWH), under the auspices of UNESCO, in Khartoum, Sudan has taken a leading role on water harvesting within G-WADI. RCWH has held four major water harvesting events in the last three years. 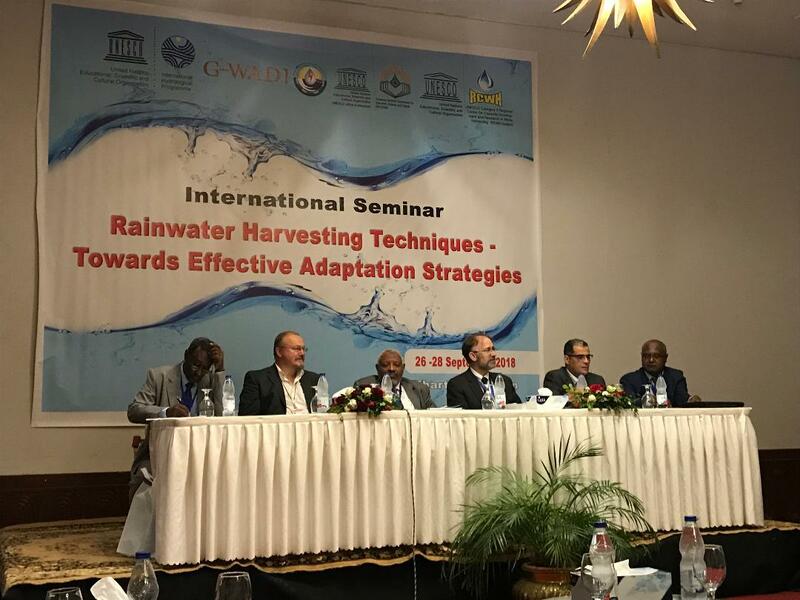 The most recent of these, titled “International Seminar on Rainwater Harvesting Techniques – Towards Effective Adaptation Strategies” was held on 26-28 September 2018 in Khartoum. The objective of this seminar was to gather and exchange knowledge of different water harvesting techniques in South Asia, East Africa and in the Arab region. Participants came from Pakistan, India, Oman, Egypt, Kenya, Tanzania, Ethiopia and South Africa, in addition to Sudan, France and the United States. Techniques discussed ranged from individual systems to barrages and sand dams to regional scale Managed Aquifer Recharge projects. The purposes of the systems discussed varied from flash flood management and agricultural water use to adaptation to climate variability and change. A regional meeting of the Arab and Sub-Saharan African G-WADI networks was held before the seminar. Following the meeting, a hydroclimatologist from ICIWaRM/G-WADI partner, the University of California, Irvine remained in Khartoum to assist Sudanese scientists with the use of the iRain and RainSphere tools – for real-time precipitation estimates and long-term precipitation trends, respectively. In addition to the RCWH and G-WADI, the event was co-sponsored by the Flanders UNESCO Trust Fund (FUST), through their Enhancing Climate Services for Improved Water Management (CLIMWAR) Project. The University of Khartoum’s Water Research Centre also played a strong role in the event, which links to IHP Phase VIII—Water Security: Responses to Local, Regional and Global Challenges.